After the 1979 revolution, as a result of both political and literary frustration, the new literary movements not only presented themselves as apolitical but also radically rejected any possible relation between politics and literature. However, their literary works, on the opposite, democratized the literary language, embraced the polyphonic forms, challenged the established processes of meaning production and rejected the sovereignty of literary representation. Iranian language writing emerged as the most radical trend among these new movements. Reza Baraheni was the first poet and theorist who suggested a new approach toward Persian poetry called "Zabaniat" or "Linguality". His called for emancipation of poetry from any exterior referentiality. But the younger generation of language writers realized that these new literary trends lack a comprehensive theory capable of explaining the "necessity" of these new experiments and distinguishing them from mere avant-garde experimentalism. This is where Iranian language writing met American L=A=N=G=U=A=G=E. I noticed that American language writing tried an opposite route toward the same destination, which was a radical approach toward the "politics of literature" that led to their own practice of language writing. Maybe, the only movement before L=A=N=G=U=A=G=E that focused on the issue of politics of language, defining language as the house of power and literature as a resistant alternative, was Situationist International. So I started to translate their most important works on this topic: "All the King's Men" by Debord, "The Captive Words" by Khayati and "Language of Those in the Know" by Becker Ho . Then I read the groundbreaking manifesto for American language writing, "Aesthetic Tendency and the Politics of Poetry" (1988) along with "Writing Social Work and Political Practice" by Bruce Andrews and "Artifice of Absorption" by Charles Bernstein. During that time I joined Dastoor's editorial board and we decided to run a special issue for L=A=N=G=U=A=G=E. Our goal was to introduce a new perspective towards language writing and to call for a theoretical reconstruction of Persian language writing through a new political viewpoint. The dossier of L=A=N=G=U=A=G=E in Dastoor magazine is actually part of a special issue focused on "Language of Crisis." The other part is on Reza Baraheni's Prison Poems. Shortly after we published the magazine, the question of "politics of poetry" became one of the most popular topics for the Iranian literary theory. 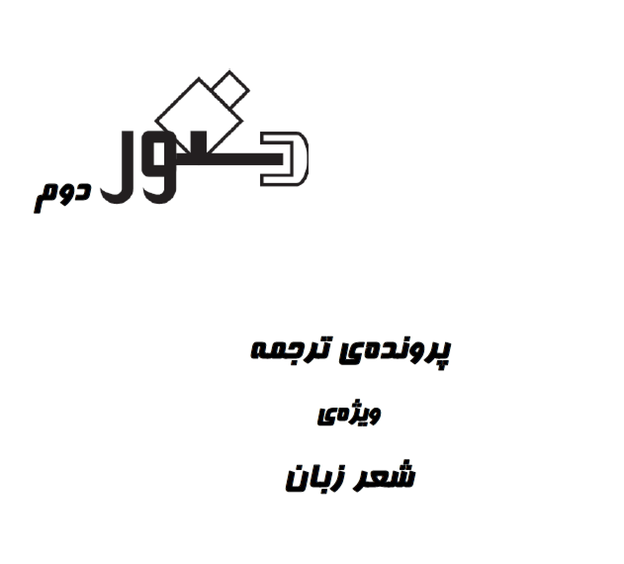 Right after that I published the first Farsi translation of Kathy Acker's novel, Algeria. which had a great influence on Iranian novelists. However, there is still a massive resistance against writers such as Bernsein, Silliman and Acker or literary movements such as L=A=N=G=U=A=G=E within the established intellectual circles of Iran. The anthology was not only the first anthology of American language Writing in Farsi, but also the very first time of introducing the American Language Writers into Farsi. The anthology is not a book- not yet at least — it was published in an online underground literary magazine, Dastoor, during the uprisings in 2009. Simply because it was almost impossible at that time to get permission from the censorship department to publish such a book. The L=A=N=G=U=A=G=E anthology goes from page 98 to 248. This issue has three sections, the first is a dossier for a young poet, the second is a dossier about Reza Baraheni (one of the founders of language poetry in Farsi) and his prison poems. The third section is the anthology of American Language writing. I am happy to tell you that publishing this anthology had (and still has) a great influence on young writers and radically changed their approaches toward the language writing and more important toward the politcs of writing. I am still working on this anthology (trying to improve it and add more important texts such as “The Aesthetic Tendency and the Politics of Poetry” and poems, specially poems by the next generation of language poets such as Juliana Spahr) and with some changes in cultural policies of Iranian government I am very optimistic about publishing it as a book in Iran. At the end you can find the poems in original language.